A series on 20th Century Classics that has concentrated on writers on the colonies would clearly be lacking if it omitted Rudyard Kipling. He was the first British writer who made his name by writing about India, and is still I think one of the most instructive. Of course he began writing in the 19th century, and had in fact long left India behind as a subject by the time the last century began. Still, he continues to be known best for his Indian writings, the short story collection ‘Plain Tales from the Hills ‘, with which he made his name, ‘The Jungle Book’, the strangely wistful poetry, notably ‘The Road to Mandalay’ and ‘Gunga Din’, and of course his masterpiece, ‘Kim’. There was little romance in Cary, while Scott and Forster exuded it. So too did Kipling. Indeed there is probably little else in Kipling, as far as sexual love goes, to match ‘Without Benefit of Clergy’ and ‘Beyond the Pale’, his accounts of inter-racial affairs. And ‘Yoked with an Unbeliever’, his account of an Engishman who forgot his fiancée and started an affair with a hill girl, to be joined afterwards by the fiancée when her husband died, is positively modern in what Victorian England would doubtless have seen as a thoroughly amoral conclusion – ‘Now the particular sin and shame of the whole business is that Phil, who really is not worth thinking of twice, was and is loved by Dunmanya, and more than loved by Agnes’. In short, Kipling was concerned mainly with work, the duties his imperial servants, as he saw them, fulfilled in the field. Romance then was largely about companionship for him, and he could express this straightforwardly, in a period in which sexual connotations would not be seen in relations between men at work. Thus, as Angus Wilson puts it in his brilliant biography, ‘The Strange Ride of Rudyard Kipling’, though the principal character in ‘Soldiers Three’, Mulvaney, has in Dinah Shadd a wonderfully understanding wife, real intimacy came to him from the other two of the Soldiers Three. The theme of intimacy springing from and developing through shared duty occurs elsewhere in Kipling too, most notably in his stories of the Roman soldiers in Britain, upholding civilization in a barbaric context – for Kipling, celebrant of the British Empire, was also acutely aware of the cycles of history, and of how other races had brought to Britain the civilization that they now thought justified their control of India. Parnesius and Pertinax are deeply committed to each other, as are the Norman Sir Richard and the Saxon Sir Hugh, in Kipling’s account of the period which saw the racial intermingling that produced modern England. 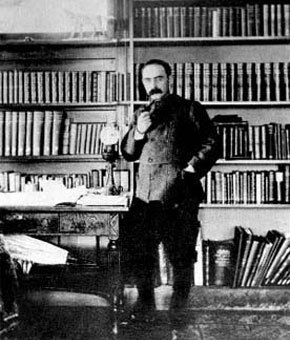 Work then as the source and the result of professional intimacy lies at the root of Kipling’s world view. Sadly perhaps for his protagonists, there is usually a sense of austerity accompanying all this, duty performed in a distant world, that of ‘the desolate river bank and idleness and regrets’ as Wilson termed it. In that sense one can understand why Kipling never went back to India after his thirties, married the sister of his great friend Wolcott Ballestier, and settled down into being a country gentleman in Sussex, the landscape of which he also managed in his later work to bathe in romance, albeit also of a melancholy sort. And yet that is not the whole story, for in three of his works he managed to evoke an exuberant world, of laughter as well as survival. Two of these were in essence schoolboy stories, the ‘Jungle Book’ where Mowgli and his animal mentors overcome all difficulties, and ‘Stalky and Co’, about schoolboys dealing with the absurdities of their masters and their fellows. There are those who have argued that this is the essence of Kipling, precocious genius with little in him for the adult world. But while speculation about arrested development is entertaining, it is belied not only by the range of his work, but also by ‘Kim’, again a novel about a boy, but one that is deeply spiritual as well as a study of politics and society in a fascinating period in Imperial Indian history. The phrase ‘The Great Game’ was essentially popularized by Kipling, and it is ‘Kim’ that deals most memorably with the rivalry between British and Russians for control of strategic areas in the subcontinent, rivalry that, as we have noted, informed the British decision to precipitate partition. But Kipling also deals with a period in which Indians were emerging as active protagonists in the game and, even though the ‘good’ ones work for the British, they are presented in terms of their own strengths. Certainly the Bengali Babu, Hurree Chunder Mukherjee, emerges as courageously innovative, in contrast to the stereotype that Kipling himself had propagated in earlier writing. And most important of all is the Tibetan Buddhist whom Kipling surprisingly chose for his symbol of Indian spirituality. The result is perhaps the most extraordinary romance in fiction, between the deracinated Irish urchin Kim, and the old detached Lama. Their journeys together on the Great Trunk Road, innocent initially, then coloured by Kim’s work for the Secret Service, are challenging, entertaining and instructive.